Explanation: What's a good recipe for preparing Martian soil? Start by filling your robot's scoop a bit less than half way. Next, dump your Martian soil into one of your TEGA ovens, being sure to watch out for clumping. Then, slowly increase the temperature to over 1000 degrees Celsius over several days. Keep checking to see when your soil becomes vaporized. Finally, your Martian soil is not ready for eating, but rather sniffing The above technique is being used by the Phoenix Lander that arrived on Mars three weeks ago. Data from the first batch of baked soil should be available in a few days. Pictured above, a circular array of the Phoenix Lander's solar panels are visible on the left, while a scoop partly filled with Martian soil is visible on the right. 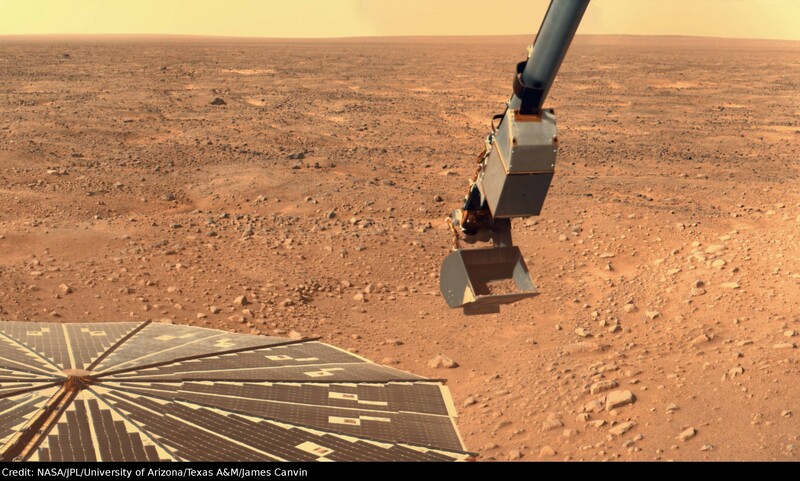 The robotic Phoenix Lander will spend much of the next three months digging, scooping, baking, sniffing, zapping, dissolving, and magnifying bits of Mars to help neighboring Earthlings learn more about the hydrologic and biologic possibilities of the sometimes mysterious red planet. Its just really cool that we are looking at another world. My dad never seen this! I'm willing to predict that within the next two or three generations that we'll be seeing some footsteps in soil as well. ... if we don't, then something went wrong with NASA.